This is NOT maple syrup combined with vinegar. 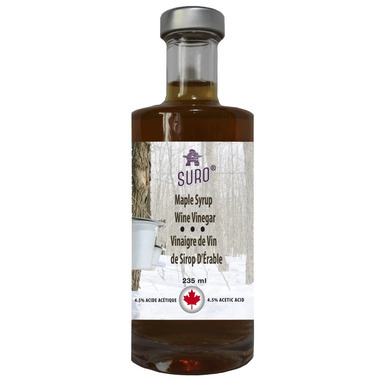 This vinegar is made uniquely from maple syrup wine. The entire process takes over 1 year to do. It is made artisanally at a sugar bush in Quebec. This vinegar brings the health benefits of unpasteurized vinegars along with minerals from maple syrup. A unique taste filled with nutriments. I recommend this on canned or baked fish and veggies. I find that it does give a delicate maple flavour to things that might otherwise be bland. We make our own maple syrup. I don't get any maple flavour from this product. Disappointed.